Easter is coming, which means spring is also fast on its way! Why not make these adorable M&Ms Spring Flower Pops with the kids to celebrate?! It’s so simple to whip these up, and they’re so fun once they’re done! Made with easy Rice Krispie treats cut into circles with cookie cutters, candy melts and spring chocolate candies, you’ll love decorating and customizing these with your favorite colors! Use your finished flowers to dress up an Easter basket, or eat ‘em up right away! Spray a 9 x 13 pan with non-stick cooking spray. Set aside. In a large microwave safe bowl, melt the butter in the microwave for 45-60 seconds. Add the marshmallows and toss gently in the melted butter. Microwave the marshmallows for 1 minute and 30 seconds. Stop to stir. Melt for another 30-60 seconds until marshmallows are completely melted. Add the rice cereal to the melted marshmallows, and combine completely. Pour mixture into the prepared pan, and press evenly. Let the cereal treats set to cool completely, for at least 1 hour. Once cereal treats have cooled, begin cutting out round cereal treat shapes with round cookie or biscuit cutters. Use any size desired. 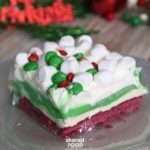 Melt the white chocolate candy melts according to package directions. 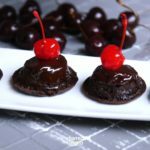 Using paper straws and/or lollipop sticks, dip the end into the melted chocolate, and then insert into the round cereal treat, about half way into the side of the treat. 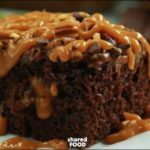 Use the remainder of the melted chocolate, coat the top sides of the pops, and decorate with the M&M’s using a variety of color combinations. Let cereal treats cool completely, at least 1 hour, before moving. Store in an airtight container for up to one week. 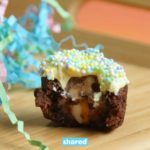 These Easter Brownie Bites Have a Cream Egg Center You Don’t Need to Hunt For!